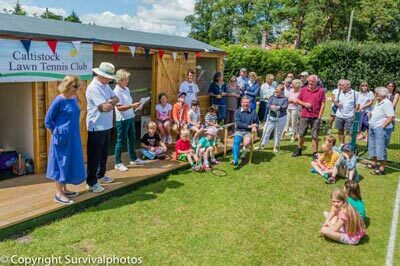 Cattistock Lawn Tennis Club was founded in the 1960’s on land provided by our President, Shirley Preston. It is situated on the Maiden Newton road into the village between West Norden Farm and Cattistock Cricket Club. Location. The courts are well maintained and we have a clubhouse with toilet facilities. Playing on grass is seasonal and weather dependent. We aim to start the season in April/May and finish in September/October. We ask members not to play if the courts are wet. The courts are available for specific hire or block booking through Rosie or Ken Barfoot 01305 261540. There is a combination lock on the gate. You will be given the number on paying your fee. Please do not reveal this number to anyone, as we have had trouble with vandals in the past. Saturday afternoons 2.15 pm onwards. Tuesday evenings 6 pm onwards. Saturdays 12.15 to 1.15 pm for Junior Coaching* & 1.15 to 2.15 pm for Senior Coaching. Sunday 11 am - Session for those who are feeling a little rusty or returning after injury. 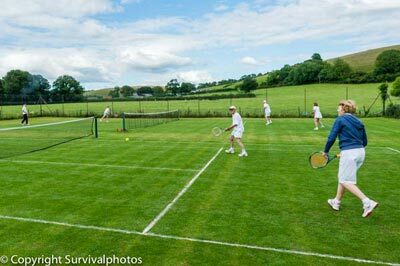 The grass courts at Cattistock can be used at any other time on a first come first serve (literally!) basis. If both courts are busy, members must vacate after one hour or by other mutual agreement. There is a block booking Thursdays from 2.30 pm until 4.30 pm for one court. *We are very fortunate to have Justin Smith as a qualified Tennis Coach, who is also available if you want private tuition. 16 to 21yrs: £15 per annum. Child: £10 per annum, children under 16 must be supervised by an adult. Family membership: 2 adults £70, plus 2 children under 16 free. Single parent: £45 plus 2 children under 16 free. Respect other players and do not make too much noise. Keep the gate shut and lock up when leaving. Do not reveal the combination lock number to non-members. Respect the nets and the courts. Do not play if too wet. Nets on the grass courts stay in situ for the whole season. No dogs or litter on the courts or in the Clubhouse. Take care when retrieving balls from the road and the adjoining field. Club balls are available by arrangement but must not be taken away. These are white with the club logo. They are available from Sally Wood on 01300 320965. Any member representing the club in a tournament must wear a club shirt. 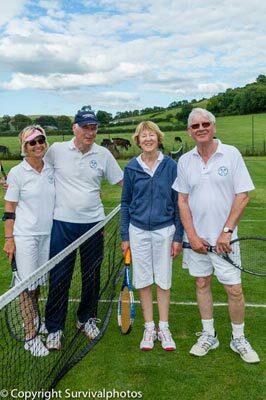 Enjoy your tennis and please support the club by encouraging new members, helping at maintenance events, and attending the social and fundraising events.